Mens white linen walking suits can be one of the best choices you can wear and look good when you're on a tropical vacation. When it's Tropics that you are heading to, Besides a suitcase, you're going to need some of these all white linen outfits for men. Just in time for Vacation are the Trust Collection of fine Mens White Linen Outfits. Trust Collection Mens Linen Outfits are made of 100% Linen fabric with a luxurious style that will make heads turn. Mens all white linen walking suits are just what you want to be seen in. 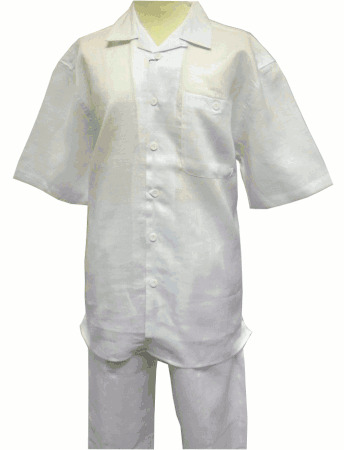 These Mens White Linen Outfit comprises of a matching pair of linen pants and matching linen shirt. The pants are double pleated and lined to the knee. It's not everyday you're going to be wearing a White Linen Outfit for Men but when you do, It's nice to know that you'll find them here with all kinds of styles to choose from. Finish your look with some Mens Summer Hats and call it a day. Many people these days are having Beach Weddings which are both romantic and cheaper than your big traditional weddings in some hall and the men in the wedding party usually are wearing a Mens White Linen Outfit and Linen Suits which are both tropical and comfortable and a heck of a lot cheaper than wearing or renting a Tux. So the next time that wedding invitation has your name on it and you're in the wedding party, just know that you may be wearing a white linen outfit. Learn More About Mens Casual Linen Outfits Here. See More Mens Linen Clothing Here. Make your first impression a positive one by being seen in Belvedere Shoes. Learn How To Care For Linen Clothes Here. Questions You May Have shopping online for Mens linen walking suits. Question: Are Casual Linen clothes comfortable to wear? Answer: Since linen is a completely all natural fiber, it is extremely comfortable to wear in the tropical heat or on the beach for a beach wedding because linen does what all natural fibers do naturally, Breath. The breath-ability of mens linen clothes is second to none when it comes to keeping as cool as possible in humid tropical weather like the weather you would see in the Islands. It is not like some fabrics you find where the heat is held in and does not wick away the moisture naturally like you might find in certain types of casual dress clothes. Question: Is there a way to keep linen clothes from wrinkling? Answer: You can try using spray starch like sizing when you iron your linen clothes but it will only help resist the wrinkling so much. Linen will wrinkle but since it is made for casual wear, you shouldn't worry about it so much. The wrinkling is actually part of the charm of linen clothes and it enhances the casual nature of the clothes. Sure you wouldn't want to wear linen to an office environment because it is made for casual wear. Linen should be thought of as clothing you wear to the beach for a beach wedding or when you are relaxing on nice tropical vacation or on a cruise ship letting your hair down. Question: Are there any recommended ways of taking care of mens linen clothes? Answer: The first thing I tell any customers about taking care of their linen clothes is that they should only wash them in cold water on a gentle cycle so the clothing doesn't get overly pulled like it would on a regular cycle and then afterward lay them flat to dry or line dry. Don't ever put linen in a dryer because you will end up shrinking your clothes and having to give them away to a kid afterward. Once your linen clothes are dry. Pull out that ironing board and fill that iron up with plenty of water and start ironing your clothes to give it that freshly pressed look and hang them up. If you are either lazy or just don't have the time, then I recommend bringing them the cleaners and let them have at it. I like to take the chore out of ironing my linen clothes by listening to my Ipod while I iron and get into a zone so it doesn't seem so cumbersome. Question: Why should I buy mens casual linen clothes? Answer: First off, linen is a very classy looking fabric and you will always see the better dressed men who appreciate wearing the finer things in life wearing linen clothes, so that should be a good incentive to start adding linen outfits to your wardrobe when you're going on vacation or it's summer time. Second, linen is extremely comfortable because of it's light weight and breath-ability so you'll forget you're wearing anything uncomfortable at all because linen is super comfortable. If linen clothing was good enough for the ancient Egyptians in the desert heat they had to deal with. It's good enough for us in the modern era. Question: How do I know what size linen outfit to order online at ContempoSuits.com? Answer: Usually the rule of thumb is to order the size linen outfit you see with your waist size listed. If you wear a 36 inch waist pants, then just order the size listed with a 36 inch waist. Depending on the brand, because we sell many different brand linen outfits, a size 36 may either come with a size large shirt or an extra large shirt, but essentially the fit will be the same size. Now if the shirt seems like one size too big, you will have to consider ordering the size down and get the pants let out to your waist size. Most of the linen outfits can be let in or let out 2 inches in most cases. If you ever have any questions or concerns on what size to order, you can always give us a call during business hours Monday through Friday. Because our linen outfits come sized as they are, we not able to mix and match the shirt and pants because we will end up having mismatched outfits and won't be able to sell them. It's sort of like selling someone a size 9 left foot shoe and a size 9.5 right foot shoe. We would have pair of shoes left that could never be sold. Question: What type of shoes can I wear with mens casual linen clothes? Answer: Depending on where you are exactly, you can wear either nice leather dress sandals with linen or nice new leather driving shoes which really look good with a linen outfit. The type with a moccasin style really brings the casual nature out in the linen outfit. Stay away from wearing any kind of sneakers with linen because that just doesn't look very flattering when you're wearing a linen outfit. You can also consider wearing some new matching color dress shoes as well which will dress up your linen sets quite a bit. It all depends on where you're going to be that day or night. If you're at a beach wedding, I wouldn't recommend wearing dress shoes but wearing some sandals or moccasins at that event.